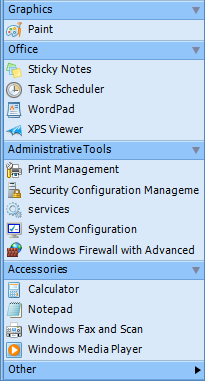 By creating virtual groups Start Menu 10 opens new interface possibilities. You can manage how the group contents are displayed. The group can be folded and its contents can be accessed by passing the cursor over it. The group can be unfolded and display the contents right in the menu. Therefore, you can have your most often used programs in unfolded groups, while rarely used groups can be folded.